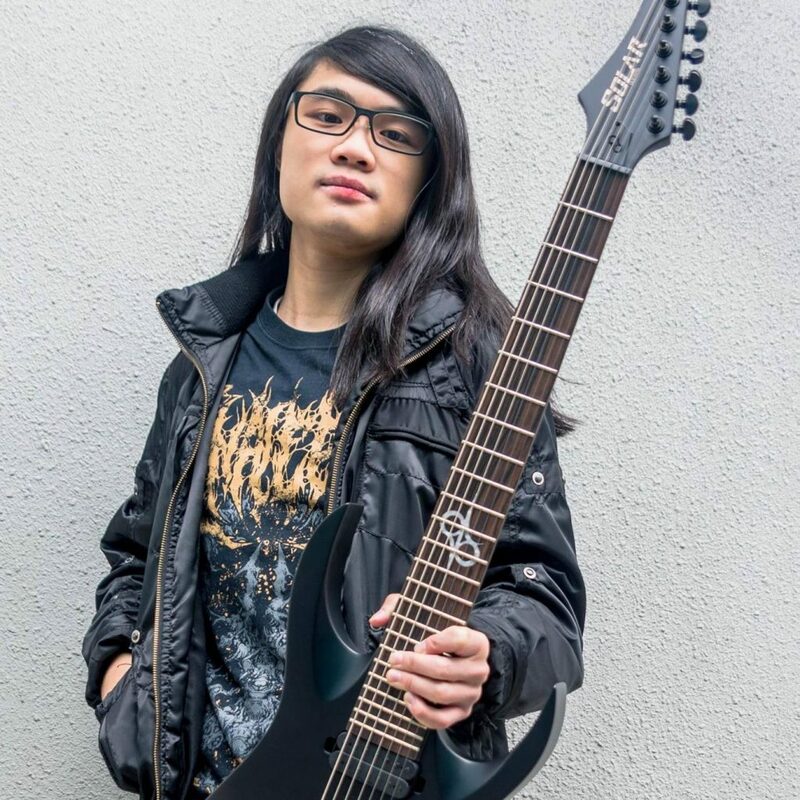 A few days ago an immensely busy Hong Kong metal guitarist who slays it not one but four different bands, Wilson Ng, announced to the world that he is now a proud endorsee of Solar Guitars. He has a featured artist page up on Solar Guitars’ official website and we, as in us members of the underground heavy music community of Hong Kong, couldn’t be prouder that one of our own has received this recognition. For those who don’t know – Solar Guitars is a company started by Ola Englund guitarist of The Haunted so for Ola to personally endorse Wilson is a pretty damn big deal! Today we sat down with Wilson for a quick interview to find out more about him, his bands and of course his collaboration with Solar Guitars. Hey Wilson can you tell us what’s going on in your world in terms of all the bands you’re in? Facelift Deformation – we just released our debut album this past May. Incestuous Impregntion has signed to Lord of the Sick Recordings and they will be releasing our debut EP before the end of the year. For my other two bands Dimensional Decay and Vicious Intent, both these bands are currently in negotiations with a couple labels right now. Once we confirm something we will announce it. Nothing special?! That’s insane man!!! Are all these bands located in Hong Kong? Not all. Facelift includes myself, vocalist Randy of Human Betrayer and a bassist from Taiwan named Larry Wang. In Incestuous Impregnation, the vocalist and drummer are both from the US. My other two projects have friends from the US and France helping out. How in the world do you manage all these bands especially when the band members are not all located in one city? Actually for me, working online with bands is so much easier because you don’t have to actually practice all together. To write a song I just simply write the main guitar lines and a rough drum idea. Then I send the GP5 files to my band members and they edit/correct the music and add whatever they want. Then we each record our parts, collect all the DI tracks. Some of the projects I’ll then mix it all myself, but for some projects I’ll send it out to an audio engineer somewhere in the US. The coolest part is we actually rarely communicate using words, we communicate through Guitar Pro files. That’s amazing! Technology these days is insane! So for all your bands are you the one that starts the song ideas first? How does that work when your bands are first hashing out ideas for music? Yeah tech these days is pretty overkill. Musicians don’t need to actually rent a practice room anymore, or by insanely expensive amps and pedals to make good music. Instead, what’s most important these days are the ideas. When you have an idea, write it down, record some rough tracks and start sending it out to people. For those unaware of your four bands – can you describe them for everyone. Are they similar in style? Facelift is slamming brutal death, Vicious Intent is deathcore, Dimensional Decay is slamming deathcore and Incestuous Impregnation is also slamming brutal death. I would say many people don’t know the difference between Slam, Brutal death and Deathcore but each genre has its characteristic riffs and patterns and most of the time, only musicians who are experienced in writing death metal can distinguish between these characteristics. People well versed in metal and extreme death metal can also tell the difference. I mean their really are unique sounds and song structures for all these types of metal. This is why I feel like I need more than one band. To me, clearly differentiating between the genres is very important. How did the endorsement with Solar Guitars happen? Guitar companies usually spend quite a lot of time searching for and reaching out to artists to offer endorsement deals. In my case I actually wrote a letter directly to the owner of Solar Guitars – Ola. I included introductions to my bands and of course my YouTube channel. I basically did what anyone would do when they’re applying for a job! You list your past experiences, your ideas and goals, and how you would be of benefit to the brand, and vice versa. And when they wrote back favorably did you lose your mind?! I mean by this time how long have you been playing guitar? What a great immense recognition for your efforts! 9 years! I started playing when I was 12. What is the exact deal you have with Solar Guitars? Well for me I’m not a very well known artists or celebrity guitarist so people in my shoes, guitars companies usually provide pretty amazing discount on guitars. And then they just mail it to you from overseas? Yup – the send it worldwide. Out of the amazing line of guitars that Solar has out there, what did you pick as your first guitar? What were you looking for in a guitar? I picked the A1.7ET. At the time it was the top model before they began releasing some limited models. It comes with an Evertune bridge which for those who don’t know, helps keep your guitar in tune. It also comes with Ola Englund’s signature pickups which are perfect for me! Awesome man! So as you work on these new releases for 2018 – what’s in store for you in terms of playing live? I don’t really have much experience playing live, but I do run and manage my own youtube channel where I record all my covers. Any last thoughts/advice to people out there? One who overcomes others is strong; one who overcomes himself is mighty.